2014-04-20 15:47:24: purge_relay_logs script started. Removing hard linked relay log files server03-relay-bin* under /data/.. done. Creating hard link for /data/mysql/server03-relay-bin.000001 under /data//server03-relay-bin.000001 .. ok. Creating hard links for unused relay log files completed. Executing SET GLOBAL relay_log_purge=1; FLUSH LOGS; sleeping a few seconds so that SQL thread can delete older relay log files (if it keeps up); SET GLOBAL relay_log_purge=0; .. ok.
2014-04-20 15:47:27: All relay log purging operations succeeded. Sun Apr 20 17:17:39 2014 - [warning] Global configuration file /etc/masterha_default.cnf not found. Skipping. Sun Apr 20 17:17:39 2014 - [info] Reading application default configurations from /etc/masterha/app1.cnf..
Sun Apr 20 17:17:39 2014 - [info] Reading server configurations from /etc/masterha/app1.cnf..
Sun Apr 20 17:17:39 2014 - [info] Starting SSH connection tests..
Sun Apr 20 17:17:39 2014 - [debug]  Connecting via SSH from root@192.168.0.50(192.168.0.50:22) to root@192.168.0.60(192.168.0.60:22)..
Sun Apr 20 17:17:39 2014 - [debug]   ok.
Sun Apr 20 17:17:39 2014 - [debug]  Connecting via SSH from root@192.168.0.50(192.168.0.50:22) to root@192.168.0.70(192.168.0.70:22)..
Sun Apr 20 17:17:40 2014 - [debug]  Connecting via SSH from root@192.168.0.60(192.168.0.60:22) to root@192.168.0.50(192.168.0.50:22)..
Sun Apr 20 17:17:40 2014 - [debug]   ok.
Sun Apr 20 17:17:40 2014 - [debug]  Connecting via SSH from root@192.168.0.60(192.168.0.60:22) to root@192.168.0.70(192.168.0.70:22)..
Sun Apr 20 17:17:40 2014 - [debug]  Connecting via SSH from root@192.168.0.70(192.168.0.70:22) to root@192.168.0.50(192.168.0.50:22)..
Sun Apr 20 17:17:40 2014 - [debug]  Connecting via SSH from root@192.168.0.70(192.168.0.70:22) to root@192.168.0.60(192.168.0.60:22)..
Sun Apr 20 17:17:41 2014 - [debug]   ok.
Sun Apr 20 17:17:41 2014 - [info] All SSH connection tests passed successfully. Sun Apr 20 18:36:55 2014 - [info] Checking replication health on 192.168.0.60..
Sun Apr 20 18:36:55 2014 - [info]  ok.
Sun Apr 20 18:36:55 2014 - [info] Checking replication health on 192.168.0.70..
Bareword "FIXME_xxx" not allowed while "strict subs" in use at /usr/local/bin/master_ip_failover line 88. Sun Apr 20 18:36:55 2014 - [error][/usr/local/share/perl5/MHA/MasterMonitor.pm, ln214]  Failed to get master_ip_failover_script status with return code 255:0. Sun Apr 20 18:36:55 2014 - [error][/usr/local/share/perl5/MHA/MasterMonitor.pm, ln478] Error happened on monitoring servers. Sun Apr 20 18:36:55 2014 - [info] Got exit code 1 (Not master dead). Can't exec "mysqlbinlog": No such file or directory at /usr/local/share/perl5/MHA/BinlogManager.pm line 99. Sun Apr 20 18:46:08 2014 - [info] Checking replication health on 192.168.0.60..
Sun Apr 20 18:46:08 2014 - [info]  ok.
Sun Apr 20 18:46:08 2014 - [info] Checking replication health on 192.168.0.70..
Sun Apr 20 18:46:08 2014 - [warning] master_ip_failover_script is not defined. Sun Apr 20 18:46:08 2014 - [warning] shutdown_script is not defined. Sun Apr 20 18:46:08 2014 - [info] Got exit code 0 (Not master dead). Sun Apr 20 19:12:01 2014 - [info]   Connecting to root@192.168.0.70(192.168.0.70:22)..
Sun Apr 20 19:12:01 2014 - [info] Slaves settings check done. Sun Apr 20 19:12:01 2014 - [warning] master_ip_failover_script is not defined. Sun Apr 20 19:12:01 2014 - [warning] shutdown_script is not defined. Sun Apr 20 19:12:01 2014 - [info] Set master ping interval 1 seconds. Sun Apr 20 19:12:01 2014 - [info] Starting ping health check on 192.168.0.50(192.168.0.50:3306)..
Sun Apr 20 19:12:01 2014 - [info] Ping(SELECT) succeeded, waiting until MySQL doesn't respond..
Apr 20 20:22:16 192 Keepalived_healthcheckers: Opening file '/etc/keepalived/keepalived.conf'. Apr 20 20:22:16 192 kernel: IPVS: ipvs loaded. Apr 20 20:22:20 192 Keepalived_vrrp: VRRP_Instance(VI_1) setting protocol VIPs. Apr 20 20:26:18 192 Keepalived_vrrp: Opening file '/etc/keepalived/keepalived.conf'. Apr 20 20:26:18 192 Keepalived_healthcheckers: Opening file '/etc/keepalived/keepalived.conf'. Apr 20 20:26:18 192 kernel: IPVS: ipvs loaded. Sun Apr 20 23:10:01 2014 - [info] Slaves settings check done. Sun Apr 20 23:10:01 2014 - [info] Checking replication health on 192.168.0.60..
Sun Apr 20 23:10:01 2014 - [info]  ok.
Sun Apr 20 23:10:01 2014 - [info] Checking replication health on 192.168.0.70..
Sun Apr 20 23:10:01 2014 - [warning] shutdown_script is not defined. Sun Apr 20 23:10:01 2014 - [info] Got exit code 0 (Not master dead). Mon Apr 21 20:15:45 2014 - [info] Executing seconary network check script: /usr/local/bin/masterha_secondary_check -s server03 -s server02 --user=root --master_host=server02 --master_ip=192.168.0.50 --master_  Creating /tmp if not exists..    ok.
Mon Apr 21 20:15:48 2014 - [warning] Global configuration file /etc/masterha_default.cnf not found. Skipping. Mon Apr 21 20:15:48 2014 - [info] Reading application default configurations from /etc/masterha/app1.cnf..
Mon Apr 21 20:15:48 2014 - [info] Reading server configurations from /etc/masterha/app1.cnf.. Monitoring server server02 is reachable, Master is not reachable from server02. OK.
Mon Apr 21 20:15:46 2014 - [info] Master is not reachable from all other monitoring servers. Failover should start. Mon Apr 21 20:15:46 2014 - [warning] Connection failed 1 time(s)..
Mon Apr 21 20:15:47 2014 - [warning] Connection failed 2 time(s)..
Mon Apr 21 20:15:48 2014 - [warning] Connection failed 3 time(s)..
Mon Apr 21 20:15:48 2014 - [warning] Master is not reachable from health checker! Mon Apr 21 20:15:48 2014 - [warning] Master 192.168.0.50(192.168.0.50:3306) is not reachable! Mon Apr 21 20:15:48 2014 - [warning] SSH is reachable. Mon Apr 21 20:15:48 2014 - [info] Connecting to a master server failed. Reading configuration file /etc/masterha_default.cnf and /etc/masterha/app1.cnf again, and trying to connect to all servers to check server status..
Mon Apr 21 20:15:48 2014 - [info] Checking slave configurations..
Mon Apr 21 20:15:48 2014 - [info] Checking replication filtering settings..
Mon Apr 21 20:15:48 2014 - [info]  Replication filtering check ok.
Mon Apr 21 20:15:48 2014 - [info] Master is down! Mon Apr 21 20:15:48 2014 - [info] Terminating monitoring script. Mon Apr 21 20:15:48 2014 - [info] Got exit code 20 (Master dead). Mon Apr 21 20:15:48 2014 - [info] MHA::MasterFailover version 0.53. Mon Apr 21 20:15:48 2014 - [info] Starting master failover. Mon Apr 21 20:15:48 2014 - [info] * Phase 1: Configuration Check Phase..
Mon Apr 21 20:15:48 2014 - [info] Checking master reachability via mysql(double check)..
Mon Apr 21 20:15:48 2014 - [info]  ok.
Mon Apr 21 20:15:49 2014 - [info] ** Phase 1: Configuration Check Phase completed. Mon Apr 21 20:15:49 2014 - [info] * Phase 2: Dead Master Shutdown Phase..
Mon Apr 21 20:15:49 2014 - [info] Forcing shutdown so that applications never connect to the current master..
Mon Apr 21 20:15:49 2014 - [info]  done. Mon Apr 21 20:15:49 2014 - [warning] shutdown_script is not set. Skipping explicit shutting down of the dead master. Mon Apr 21 20:15:49 2014 - [info] * Phase 2: Dead Master Shutdown Phase completed. Mon Apr 21 20:15:49 2014 - [info] * Phase 3: Master Recovery Phase..
Mon Apr 21 20:15:49 2014 - [info] * Phase 3.1: Getting Latest Slaves Phase..
Mon Apr 21 20:15:49 2014 - [info] * Phase 3.2: Saving Dead Master's Binlog Phase..
Mon Apr 21 20:15:49 2014 - [info] Fetching dead master's binary logs.. Creating /tmp if not exists..    ok.
Concat binary/relay logs from mysql-bin.000018 pos 112 to mysql-bin.000018 EOF into /tmp/saved_master_binlog_from_192.168.0.50_3306_20140421201548.binlog .. Dumping binlog format description event, from position 0 to 112.. ok. Dumping effective binlog data from /data/mysql/mysql-bin.000018 position 112 to tail(131).. ok.
Mon Apr 21 20:15:50 2014 - [info] scp from root@192.168.0.50:/tmp/saved_master_binlog_from_192.168.0.50_3306_20140421201548.binlog to local:/var/log/masterha/app1.log/saved_master_binlog_from_192.168.0.50_3306_20140421201548.binlog succeeded. Mon Apr 21 20:15:50 2014 - [info] HealthCheck: SSH to 192.168.0.60 is reachable. Mon Apr 21 20:15:50 2014 - [info] HealthCheck: SSH to 192.168.0.70 is reachable. Mon Apr 21 20:15:50 2014 - [info] * Phase 3.3: Determining New Master Phase..
Mon Apr 21 20:15:50 2014 - [info] Finding the latest slave that has all relay logs for recovering other slaves..
Mon Apr 21 20:15:50 2014 - [info] All slaves received relay logs to the same position. No need to resync each other. Mon Apr 21 20:15:50 2014 - [info] Searching new master from slaves..
Mon Apr 21 20:15:50 2014 - [info]  Searching from candidate_master slaves which have received the latest relay log events..
Mon Apr 21 20:15:50 2014 - [info] Starting master failover..
Mon Apr 21 20:15:50 2014 - [info] * Phase 3.3: New Master Diff Log Generation Phase..
Mon Apr 21 20:15:50 2014 - [info]  This server has all relay logs. No need to generate diff files from the latest slave. Mon Apr 21 20:15:50 2014 - [info] Sending binlog..
Mon Apr 21 20:15:51 2014 - [info] scp from local:/var/log/masterha/app1.log/saved_master_binlog_from_192.168.0.50_3306_20140421201548.binlog to root@192.168.0.60:/tmp/saved_master_binlog_from_192.168.0.50_3306_20140421201548.binlog succeeded. Mon Apr 21 20:15:51 2014 - [info] * Phase 3.4: Master Log Apply Phase..
Mon Apr 21 20:15:51 2014 - [info] *NOTICE: If any error happens from this phase, manual recovery is needed. Mon Apr 21 20:15:51 2014 - [info] Starting recovery on 192.168.0.60(192.168.0.60:3306)..
Mon Apr 21 20:15:51 2014 - [info]  Generating diffs succeeded. Mon Apr 21 20:15:51 2014 - [info] Waiting until all relay logs are applied. Mon Apr 21 20:15:51 2014 - [info]  done. Mon Apr 21 20:15:51 2014 - [info] Getting slave status..
Mon Apr 21 20:15:51 2014 - [info] This slave(192.168.0.60)'s Exec_Master_Log_Pos equals to Read_Master_Log_Pos(mysql-bin.000018:112). No need to recover from Exec_Master_Log_Pos. Mon Apr 21 20:15:51 2014 - [info] Connecting to the target slave host 192.168.0.60, running recover script..
Mon Apr 21 20:15:51 2014 - [info]  All relay logs were successfully applied. Mon Apr 21 20:15:51 2014 - [info] Getting new master's binlog name and position..
Mon Apr 21 20:15:52 2014 - [info]  OK.
Mon Apr 21 20:15:52 2014 - [info] Setting read_only=0 on 192.168.0.60(192.168.0.60:3306)..
Mon Apr 21 20:15:52 2014 - [info] ** Finished master recovery successfully. Mon Apr 21 20:15:52 2014 - [info] * Phase 3: Master Recovery Phase completed. Mon Apr 21 20:15:52 2014 - [info] * Phase 4: Slaves Recovery Phase..
Mon Apr 21 20:15:52 2014 - [info] * Phase 4.1: Starting Parallel Slave Diff Log Generation Phase..
Mon Apr 21 20:15:52 2014 - [info] -- Slave diff file generation on host 192.168.0.70(192.168.0.70:3306) started, pid: 31321. Check tmp log /var/log/masterha/app1.log/192.168.0.70_3306_20140421201548.log if it takes time..
Mon Apr 21 20:15:52 2014 - [info]  This server has all relay logs. No need to generate diff files from the latest slave. Mon Apr 21 20:15:52 2014 - [info] End of log messages from 192.168.0.70. Mon Apr 21 20:15:52 2014 - [info] -- 192.168.0.70(192.168.0.70:3306) has the latest relay log events. Mon Apr 21 20:15:52 2014 - [info] Generating relay diff files from the latest slave succeeded. Mon Apr 21 20:15:52 2014 - [info] * Phase 4.2: Starting Parallel Slave Log Apply Phase..
Mon Apr 21 20:15:52 2014 - [info] -- Slave recovery on host 192.168.0.70(192.168.0.70:3306) started, pid: 31323. Check tmp log /var/log/masterha/app1.log/192.168.0.70_3306_20140421201548.log if it takes time..
Mon Apr 21 20:15:52 2014 - [info] Sending binlog..
Mon Apr 21 20:15:52 2014 - [info] scp from local:/var/log/masterha/app1.log/saved_master_binlog_from_192.168.0.50_3306_20140421201548.binlog to root@192.168.0.70:/tmp/saved_master_binlog_from_192.168.0.50_3306_20140421201548.binlog succeeded. Mon Apr 21 20:15:52 2014 - [info] Starting recovery on 192.168.0.70(192.168.0.70:3306)..
Mon Apr 21 20:15:52 2014 - [info]  Generating diffs succeeded. Mon Apr 21 20:15:52 2014 - [info] Waiting until all relay logs are applied. Mon Apr 21 20:15:52 2014 - [info]  done. Mon Apr 21 20:15:52 2014 - [info] Getting slave status..
Mon Apr 21 20:15:52 2014 - [info] This slave(192.168.0.70)'s Exec_Master_Log_Pos equals to Read_Master_Log_Pos(mysql-bin.000018:112). No need to recover from Exec_Master_Log_Pos. Mon Apr 21 20:15:52 2014 - [info] Connecting to the target slave host 192.168.0.70, running recover script..
Mon Apr 21 20:15:52 2014 - [info]  All relay logs were successfully applied. Mon Apr 21 20:15:52 2014 - [info]  Resetting slave 192.168.0.70(192.168.0.70:3306) and starting replication from the new master 192.168.0.60(192.168.0.60:3306)..
Mon Apr 21 20:15:52 2014 - [info]  Executed CHANGE MASTER. Mon Apr 21 20:15:52 2014 - [info]  Slave started. Mon Apr 21 20:15:52 2014 - [info] -- Slave recovery on host 192.168.0.70(192.168.0.70:3306) succeeded. Mon Apr 21 20:15:52 2014 - [info] All new slave servers recovered successfully. Mon Apr 21 20:15:52 2014 - [info] * Phase 5: New master cleanup phease..
Mon Apr 21 20:15:52 2014 - [info] Resetting slave info on the new master..
Mon Apr 21 20:15:53 2014 - [info]  192.168.0.60: Resetting slave info succeeded. Mon Apr 21 20:15:53 2014 - [info] Master failover to 192.168.0.60(192.168.0.60:3306) completed successfully. Mon Apr 21 20:15:53 2014 - [info] Deleted server1 entry from /etc/masterha/app1.cnf . Check MHA Manager logs at server01:/var/log/masterha/app1/manager.log for details. Invalidated master IP address on 192.168.0.50. The latest slave 192.168.0.60(192.168.0.60:3306) has all relay logs for recovery. Selected 192.168.0.60 as a new master. 192.168.0.60: OK: Applying all logs succeeded. 192.168.0.60: OK: Activated master IP address. 192.168.0.70: This host has the latest relay log events. 192.168.0.70: OK: Applying all logs succeeded. Slave started, replicating from 192.168.0.60. 192.168.0.60: Resetting slave info succeeded. 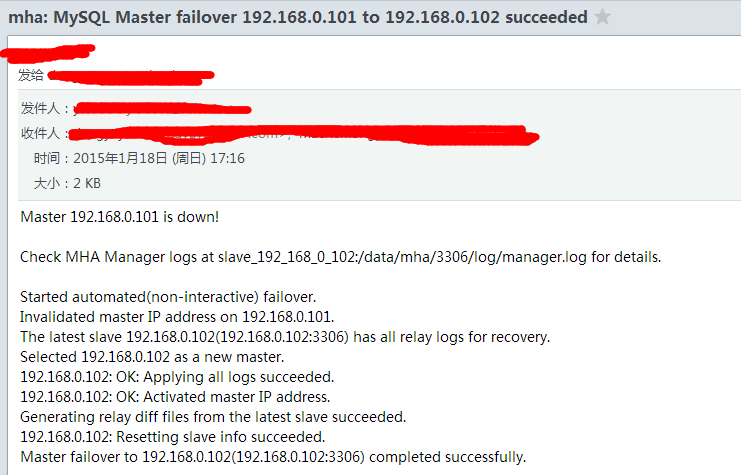 Master failover to 192.168.0.60(192.168.0.60:3306) completed successfully. Currently MHA Manager process does not run as a daemon. If failover completed successfully or the master process was killed by accident, the manager stops working. To run as a daemon, daemontool. or any external daemon program can be used. Here is an example to run from daemontools. Mon Apr 21 21:23:33 2014 - [error][/usr/local/share/perl5/MHA/MasterFailover.pm, ln181] None of server is dead. Stop failover. Mon Apr 21 21:28:00 2014 - [warning] Global configuration file /etc/masterha_default.cnf not found. Skipping. Mon Apr 21 21:28:00 2014 - [info] Reading application default configurations from /etc/masterha/app1.cnf..
Mon Apr 21 21:28:00 2014 - [info] Reading server configurations from /etc/masterha/app1.cnf..
Mon Apr 21 21:28:00 2014 - [info] MHA::MasterFailover version 0.53. Mon Apr 21 21:28:00 2014 - [info] Starting master failover. Mon Apr 21 21:28:00 2014 - [info] * Phase 1: Configuration Check Phase..
Mon Apr 21 21:28:00 2014 - [info] Checking master reachability via mysql(double check)..
Mon Apr 21 21:28:00 2014 - [info]  ok.
Mon Apr 21 21:36:01 2014 - [info] ** Phase 1: Configuration Check Phase completed. Mon Apr 21 21:36:01 2014 - [info] * Phase 2: Dead Master Shutdown Phase..
Mon Apr 21 21:36:01 2014 - [info] HealthCheck: SSH to 192.168.0.50 is reachable. Mon Apr 21 21:36:01 2014 - [info] Forcing shutdown so that applications never connect to the current master..
Mon Apr 21 21:36:02 2014 - [info]  done. Mon Apr 21 21:36:02 2014 - [warning] shutdown_script is not set. Skipping explicit shutting down of the dead master. Mon Apr 21 21:36:02 2014 - [info] * Phase 2: Dead Master Shutdown Phase completed. Mon Apr 21 21:36:02 2014 - [info] * Phase 3: Master Recovery Phase..
Mon Apr 21 21:36:02 2014 - [info] * Phase 3.1: Getting Latest Slaves Phase..
Mon Apr 21 21:36:02 2014 - [info] * Phase 3.2: Saving Dead Master's Binlog Phase..
Mon Apr 21 21:36:02 2014 - [info] Fetching dead master's binary logs..
Concat binary/relay logs from mysql-bin.000020 pos 112 to mysql-bin.000020 EOF into /tmp/saved_master_binlog_from_192.168.0.50_3306_20140421212800.binlog .. Dumping effective binlog data from /data/mysql/mysql-bin.000020 position 112 to tail(131).. ok.
Mon Apr 21 21:36:02 2014 - [info] scp from root@192.168.0.50:/tmp/saved_master_binlog_from_192.168.0.50_3306_20140421212800.binlog to local:/var/log/masterha/app1.log/saved_master_binlog_from_192.168.0.50_3306_20140421212800.binlog succeeded. Mon Apr 21 21:36:02 2014 - [info] HealthCheck: SSH to 192.168.0.60 is reachable. Mon Apr 21 21:36:03 2014 - [info] HealthCheck: SSH to 192.168.0.70 is reachable. Mon Apr 21 21:36:03 2014 - [info] * Phase 3.3: Determining New Master Phase..
Mon Apr 21 21:36:03 2014 - [info] Finding the latest slave that has all relay logs for recovering other slaves..
Mon Apr 21 21:36:03 2014 - [info] All slaves received relay logs to the same position. No need to resync each other. Mon Apr 21 21:36:03 2014 - [info] 192.168.0.60 can be new master. Mon Apr 21 21:36:03 2014 - [info] Starting master failover..
Mon Apr 21 21:36:06 2014 - [info] * Phase 3.3: New Master Diff Log Generation Phase..
Mon Apr 21 21:36:06 2014 - [info]  This server has all relay logs. No need to generate diff files from the latest slave. Mon Apr 21 21:36:06 2014 - [info] Sending binlog..
Mon Apr 21 21:36:07 2014 - [info] scp from local:/var/log/masterha/app1.log/saved_master_binlog_from_192.168.0.50_3306_20140421212800.binlog to root@192.168.0.60:/tmp/saved_master_binlog_from_192.168.0.50_3306_20140421212800.binlog succeeded. Mon Apr 21 21:36:07 2014 - [info] * Phase 3.4: Master Log Apply Phase..
Mon Apr 21 21:36:07 2014 - [info] *NOTICE: If any error happens from this phase, manual recovery is needed. Mon Apr 21 21:36:07 2014 - [info] Starting recovery on 192.168.0.60(192.168.0.60:3306)..
Mon Apr 21 21:36:07 2014 - [info]  Generating diffs succeeded. Mon Apr 21 21:36:07 2014 - [info] Waiting until all relay logs are applied. Mon Apr 21 21:36:07 2014 - [info]  done. Mon Apr 21 21:36:07 2014 - [info] Getting slave status..
Mon Apr 21 21:36:07 2014 - [info] This slave(192.168.0.60)'s Exec_Master_Log_Pos equals to Read_Master_Log_Pos(mysql-bin.000020:112). No need to recover from Exec_Master_Log_Pos. Mon Apr 21 21:36:07 2014 - [info] Connecting to the target slave host 192.168.0.60, running recover script..
Mon Apr 21 21:36:07 2014 - [info]  All relay logs were successfully applied. Mon Apr 21 21:36:07 2014 - [info] Getting new master's binlog name and position..
Mon Apr 21 21:36:08 2014 - [info]  OK.
Mon Apr 21 21:36:08 2014 - [info] Setting read_only=0 on 192.168.0.60(192.168.0.60:3306)..
Mon Apr 21 21:36:08 2014 - [info] ** Finished master recovery successfully. Mon Apr 21 21:36:08 2014 - [info] * Phase 3: Master Recovery Phase completed. Mon Apr 21 21:36:08 2014 - [info] * Phase 4: Slaves Recovery Phase..
Mon Apr 21 21:36:08 2014 - [info] * Phase 4.1: Starting Parallel Slave Diff Log Generation Phase..
Mon Apr 21 21:36:08 2014 - [info] -- Slave diff file generation on host 192.168.0.70(192.168.0.70:3306) started, pid: 33518. Check tmp log /var/log/masterha/app1.log/192.168.0.70_3306_20140421212800.log if it takes time..
Mon Apr 21 21:36:08 2014 - [info]  This server has all relay logs. No need to generate diff files from the latest slave. Mon Apr 21 21:36:08 2014 - [info] End of log messages from 192.168.0.70. Mon Apr 21 21:36:08 2014 - [info] -- 192.168.0.70(192.168.0.70:3306) has the latest relay log events. Mon Apr 21 21:36:08 2014 - [info] Generating relay diff files from the latest slave succeeded. Mon Apr 21 21:36:08 2014 - [info] * Phase 4.2: Starting Parallel Slave Log Apply Phase..
Mon Apr 21 21:36:08 2014 - [info] -- Slave recovery on host 192.168.0.70(192.168.0.70:3306) started, pid: 33520. Check tmp log /var/log/masterha/app1.log/192.168.0.70_3306_20140421212800.log if it takes time..
Mon Apr 21 21:36:08 2014 - [info] Sending binlog..
Mon Apr 21 21:36:08 2014 - [info] scp from local:/var/log/masterha/app1.log/saved_master_binlog_from_192.168.0.50_3306_20140421212800.binlog to root@192.168.0.70:/tmp/saved_master_binlog_from_192.168.0.50_3306_20140421212800.binlog succeeded. Mon Apr 21 21:36:08 2014 - [info] Starting recovery on 192.168.0.70(192.168.0.70:3306)..
Mon Apr 21 21:36:08 2014 - [info]  Generating diffs succeeded. Mon Apr 21 21:36:08 2014 - [info] Waiting until all relay logs are applied. Mon Apr 21 21:36:08 2014 - [info]  done. Mon Apr 21 21:36:08 2014 - [info] Getting slave status..
Mon Apr 21 21:36:08 2014 - [info] This slave(192.168.0.70)'s Exec_Master_Log_Pos equals to Read_Master_Log_Pos(mysql-bin.000020:112). No need to recover from Exec_Master_Log_Pos. Mon Apr 21 21:36:08 2014 - [info] Connecting to the target slave host 192.168.0.70, running recover script..
Mon Apr 21 21:36:09 2014 - [info]  All relay logs were successfully applied. Mon Apr 21 21:36:09 2014 - [info]  Resetting slave 192.168.0.70(192.168.0.70:3306) and starting replication from the new master 192.168.0.60(192.168.0.60:3306)..
Mon Apr 21 21:36:09 2014 - [info]  Executed CHANGE MASTER. Mon Apr 21 21:36:09 2014 - [info]  Slave started. Mon Apr 21 21:36:09 2014 - [info] End of log messages from 192.168.0.70. Mon Apr 21 21:36:09 2014 - [info] -- Slave recovery on host 192.168.0.70(192.168.0.70:3306) succeeded. Mon Apr 21 21:36:09 2014 - [info] All new slave servers recovered successfully. Mon Apr 21 21:36:09 2014 - [info] * Phase 5: New master cleanup phease..
Mon Apr 21 21:36:09 2014 - [info] Resetting slave info on the new master..
Mon Apr 21 21:36:09 2014 - [info]  192.168.0.60: Resetting slave info succeeded. Mon Apr 21 21:36:09 2014 - [info] Master failover to 192.168.0.60(192.168.0.60:3306) completed successfully. Check MHA Manager logs at server01 for details. Wed Apr 23 00:27:39 2014 - [info] MHA::MasterRotate version 0.53. Wed Apr 23 00:27:39 2014 - [info] Starting online master switch.. Wed Apr 23 00:27:39 2014 - [info] * Phase 1: Configuration Check Phase.. Wed Apr 23 00:27:39 2014 - [info] Reading default configuratoins from /etc/masterha_default.cnf.. Wed Apr 23 00:27:39 2014 - [info] Reading application default configurations from /etc/masterha/app1.cnf.. Wed Apr 23 00:27:39 2014 - [info] Reading server configurations from /etc/masterha/app1.cnf.. Wed Apr 23 00:27:40 2014 - [info] Executing FLUSH NO_WRITE_TO_BINLOG TABLES. This may take long time.. Wed Apr 23 00:27:40 2014 - [info]  ok. Wed Apr 23 00:27:40 2014 - [info] Checking MHA is not monitoring or doing failover.. Wed Apr 23 00:27:40 2014 - [info] Checking replication health on 192.168.0.60.. Wed Apr 23 00:27:40 2014 - [info] Checking replication health on 192.168.0.70.. Wed Apr 23 00:27:40 2014 - [info] 192.168.0.60 can be new master. Wed Apr 23 00:27:41 2014 - [info] Checking whether 192.168.0.60(192.168.0.60:3306) is ok for the new master.. Wed Apr 23 00:27:41 2014 - [info]  ok. Wed Apr 23 00:27:41 2014 - [info] ** Phase 1: Configuration Check Phase completed. Wed Apr 23 00:27:41 2014 - [info] * Phase 2: Rejecting updates Phase.. Wed Apr 23 00:27:41 2014 714804 Set read_only on the new master.. ok. Wed Apr 23 00:27:41 2014 719969 Set read_only=1 on the orig master.. ok.
reverse mapping checking getaddrinfo for bogon [192.168.0.50] failed - POSSIBLE BREAK-IN ATTEMPT! Wed Apr 23 00:27:51 2014 963762 Killing all application threads.. Wed Apr 23 00:27:51 2014 963869 done. Wed Apr 23 00:27:51 2014 - [info]  ok. Wed Apr 23 00:27:51 2014 - [info] Executing FLUSH TABLES WITH READ LOCK.. Wed Apr 23 00:27:51 2014 - [info] Orig master binlog:pos is mysql-bin.000028:112. Wed Apr 23 00:27:51 2014 - [info]  Waiting to execute all relay logs on 192.168.0.60(192.168.0.60:3306).. Wed Apr 23 00:27:51 2014 - [info]  master_pos_wait(mysql-bin.000028:112) completed on 192.168.0.60(192.168.0.60:3306). Executed 0 events. Wed Apr 23 00:27:51 2014 - [info]   done. Wed Apr 23 00:27:51 2014 - [info] Getting new master's binlog name and position.. Wed Apr 23 00:27:52 2014 077334 Set read_only=0 on the new master. reverse mapping checking getaddrinfo for bogon [192.168.0.60] failed - POSSIBLE BREAK-IN ATTEMPT! Wed Apr 23 00:28:02 2014 - [info]  ok. Wed Apr 23 00:28:02 2014 - [info] * Switching slaves in parallel.. Wed Apr 23 00:28:02 2014 - [info]  Waiting to execute all relay logs on 192.168.0.70(192.168.0.70:3306).. Wed Apr 23 00:28:02 2014 - [info]  master_pos_wait(mysql-bin.000028:112) completed on 192.168.0.70(192.168.0.70:3306). Executed 0 events. Wed Apr 23 00:28:02 2014 - [info]   done. Wed Apr 23 00:28:02 2014 - [info]  Resetting slave 192.168.0.70(192.168.0.70:3306) and starting replication from the new master 192.168.0.60(192.168.0.60:3306).. Wed Apr 23 00:28:02 2014 - [info]  Executed CHANGE MASTER. Wed Apr 23 00:28:02 2014 - [info]  Slave started. Wed Apr 23 00:28:02 2014 - [info] -- Slave switch on host 192.168.0.70(192.168.0.70:3306) succeeded. Wed Apr 23 00:28:02 2014 - [info] Executing UNLOCK TABLES.. Wed Apr 23 00:28:02 2014 - [info] Starting orig master as a new slave.. Wed Apr 23 00:28:02 2014 - [info]  Resetting slave 192.168.0.50(192.168.0.50:3306) and starting replication from the new master 192.168.0.60(192.168.0.60:3306).. Wed Apr 23 00:28:02 2014 - [info] All new slave servers switched successfully. Wed Apr 23 00:28:02 2014 - [info] * Phase 5: New master cleanup phease.. Wed Apr 23 00:28:02 2014 - [info]  192.168.0.60: Resetting slave info succeeded. Wed Apr 23 00:28:02 2014 - [info] Switching master to 192.168.0.60(192.168.0.60:3306) completed successfully. open my $DEBUG, "> /tmp/monitormail.log"